Small crossovers are a vogue segment, drawing buyers up from lower hatchbacks and down from bigger SUVs alike. The newest entrant, creating significant buzz, is the Toyota C-HR. Australia’s biggest-selling brand has taken its time joining the fray, but based on our favourable first impression, it has been well worth the wait. Here we pitch the C-HR against the reigning three top-sellers in the class, the Mazda CX-3, Mitsubishi ASX and Honda HR-V. In order to show the maximum number of available features across all four vehicles, we have elected to test each model in its highest level of specification, with average pricing of around $33,000 before on-road costs. All cars are tested in front-wheel drive form, with petrol engines and automatic transmissions, as this configuration accounts for the overwhelming majority of sales. So we have the: Honda HR-V VTi-L, the Mazda CX-3 Akari, the Mitsubishi ASX XLS and the Toyota C-HR Koba. The cheapest car here – a reflection of its aged design – is the Mitsubishi, at a recommended retail price (before on-road costs) of $31,500. But let’s not beat around the bush, you’ll do a lot better than that if you haggle. Both the Toyota and Mazda cost $33,290 in this specification, though limited stock of the C-HR mean your chances of nabbing a deal are slim. The CX-3, on the other hand, will go on runout soon ahead of an MY17 update, so there’s upside. The Honda costs $33,340. Here is where we mention that you can get behind the wheel of each of these cars with the same drivetrains as tested here, but in lower specification grade, for between $25,000 and $30,000. In each of these cases we’d recommend looking in this direction. All of these cars in flagship specification as tested are very highly equipped, as you can read in the table at the bottom of this story. Common denominators include: rear-view camera (multi-view for the Honda), rear parking sensors, climate control, cruise control, push-button start, touchscreen, Bluetooth, USB, leather seats, rain-sensing wipers, auto on/off headlights and alloy wheels. Clearly, the Toyota takes the cake, as it’s the only car here with adaptive cruise control (which works at high speeds and to zero), and one of only two cars with features including AED, BLIS, RCTA and front sensors. All it really lacks is a sunroof compared to the others. However, we want to add that we understand Honda will add sat nav, and potentially Apple CarPlay/Android Auto, to the HR-V soon, while a MY17 Mazda CX-3 update is due in May and will add some extras including handling improvements. Mitsubishi could also potentially add CarPlay/Android soon, given most of its other models now get the tech. This means that while the Toyota comes up trumps for now, the Honda and Mazda certainly will become better-equipped for the money, which may change the overall standings somewhat. However we can only judge what we have now, and the C-HR is frankly too important to the market’s composition to delay a comparison test any longer than we have already. We’d also point out that the Mitsubishi’s pricing advantage at least somewhat offsets its paucity of modern preventative safety technologies. The Toyota C-HR is the newest car on test, and so the onus is on it to offer the most modern and interesting cabin, which it mostly does. Up front there are some really thoughtful touches on display including diamond-patterned inserts in the doors and patterns on the headlining, as well as lots of soft leather and plastic surfaces, and a classy driver-oriented interface that gives you a sporty, ensconced feel with the signature slightly higher riding height than most hatches. However, the infotainment is flawed, with the 6.1-inch screen being the smallest on test (the others are 7.0-inch) and looking decidedly aftermarket, while we’re frustrated by Toyota’s reluctance to offer Apple CarPlay and Android Auto, though none of the other older cars here have the system either. Additionally, there’s only one USB point, and it’s mounted in the head unit. 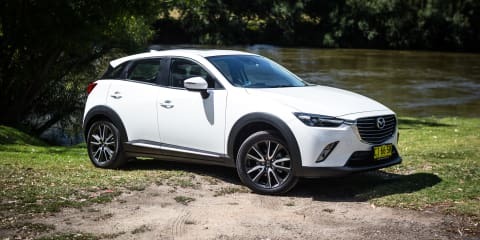 The Mazda CX-3 feels a little bit luxurious and upmarket in the brand’s typical fashion, with good used of brushed metallic-look trims, red contrasting leather (including driver’s knee pads) and a sporty steering wheel. It also has a pop-up head-up display unit, which we like, and the MZD Connect rotary dial that echoes Audi and BMW. On the downside, there’s bugger-all storage, including a complete absence of a centre console. There’s also less knee room for the driver, and some cheap plastics on the doors and transmission tunnel. Colleagues also reported some infotainment bugs as well. The Honda HR-V’s cabin is standing the test of time thanks to its clean layout, substantial use of high quality materials, and vast storage options that trounce all rivals in the segment, including a hidden spot behind the fascia. The infotainment screen is a little old hat, and lacks integrated sat nav for now as well as a proper volume knob, but the digital climate control looks classy, as do the seats, steering wheel and those alloy pedals. Other unique features include the multi-view reversing camera and the LaneWatch system that displays your left-side blind spot when you indicate, in lieu of a proper BLIS system. You also get a massive, retractable sunroof, adding to the spacious feel. The ASX is the oldest car here and it feels a little dated, in terms of the cheap-feeling materials used and the layout, though it’ll be a comfortable experience for those used to older designs. There’s plenty of storage, a large glass roof, tactile ventilation controls and a spacious feeling, thanks to the large side windows, but there’s an absence of anything you could call ‘soul’. The front seats, while heated and offering electric adjustment, are also flat and lacking side bolstering (though you have a commanding road view from them), and while you have sat nav, the UI feels a little aftermarket. To its credit, it re-pairs rapidly and offers audio quality the equal of the others. The order is rather reversed when it comes to back-seat practicality, which the Honda HR-V wins by the length of the Flemington straight. Legroom and headroom is outstanding for even three people across (thanks to the lack of a driveshaft running along the centre of the car), while you also get your own reading lights, ample storage options, a rear 12V socket and that lovely sunroof. The cargo area is also far and away the best, with the largest aperture, the deepest loading floor, and Honda’s patented one-flip Magic Seats that give you a wide and flat place to put bigger items. The ASX offers excellent space for the class, with ample leg- and headroom, great outward visibility thanks to high mounting of the bases, and a flip down centre armrest. On the downside, both Curt and Rob found the seat rear seats be be awfully flat and unsupportive (“like a church pew”), and you also miss out on amenities such as reading lights and one-touch up/down electric windows. Cargo space is just short of 400L with the back seats in use, making it the second best here behind the Honda, and as you can see they also fold pretty flat and low for Ikea trips. The Toyota C-HR belies its coupe-like looks by actually offering okay rear seat space, with scallops in the roof to help headroom, and seats with soft bases and a good pitch. However, those tiny side windows and the massive C-pillar make the back feel a little like a cave, and it’s the only car here lacking grab handles. Amenities such as armrests and separate reading lights are also absent. The storage space is actually quite okay, almost on a par with the Mitsubishi, though falling well short of the HR-V’s aperture and overall flexibility. Still, it offers more storage than many small hatchbacks and blends this with a cool design. The Mazda offers the least space for rear occupants, and in fact is more like a light city car than a crossover, though it’s hard to criticise the seats in terms of support and softness. It’s also way easier to see out the back of than the Toyota. Of course, if practicality is your bag, the Mazda is not for you. The cargo space is the smallest here, and at 264L with the back seats in use, is smaller than many light-sized passenger cars. Like the others, you can flip the seats down for longer items, but cabin flexibility has long been the Mazda’s Achilles heel. None of this quartet is endowed with a whole lot of power and torque. The car with the fewest kW and the highest weight is the Toyota, with its new 1.2-litre turbocharged engine making 85kW of power and 185Nm of torque. It’s the only car here with a turbo, but its displacement is also substantially smaller than the others. 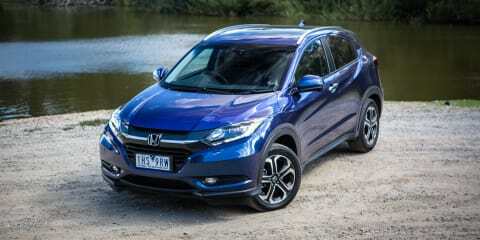 Next is the Honda HR-V’s 1.8-litre engine making 105kW and 172Nm — the lowest torque figure here. Both the Mazda and Mitsubishi use 2.0-litre engines, the former’s making 109kW/192Nm and the latter’s a princely 110kW/197Nm, though the CX-3 is lighter. Indeed, the power-to-weight ratios (in this case, kW per tonne) tell a tale. The order goes: Mazda (91.6), Mitsubishi (83), Honda (76.9) and Toyota (60.3). The Honda, Mitsubishi and the Toyota all use CVT automatic transmissions focused on maximising fuel economy, whereas the Mazda has a more conventional six-speed automatic with torque converter and ratios. As ever, the figures don’t tell the full tale, though as you might expect the Mazda CX-3 is the quickest car here. It’s clearly the punchiest and most responsive off the mark (relatively speaking!) and its automatic is intuitive and – in its sports mode – aggressive. On the downside, the little engine is also raucous or loud under strain, sending more noise and vibrations into the cabin than the other cars on test. One test saw us pull four occupants up a moderate hill, and it was screaming at 7000rpm. The Toyota is not a quick car, but it’s not as sluggish as you might think, in large part because its peak torque is available much earlier than in its non-turbo rivals – from 1500rpm. This means you don’t need to rev its guts out to access peak performance and this makes the C-HR the most refined car here. The rolling response is also adequate for the class. The car might labour a little, but it never shouts about it. 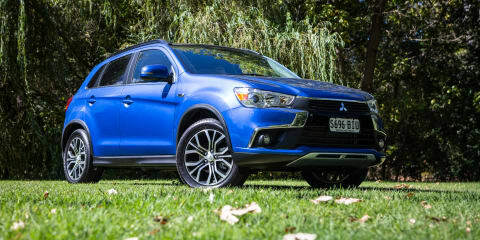 The Mitsubishi is the oldest car here, and feels it, though the engine is up to the task, with decent urban response and acceptable refinement at a freeway speed. However, we found it a little harsh – thanks to the raucous CVT – on our hill test under heavy throttle. It’s sufficiently quick but lacks refinement. Like the Mitsubishi, the Honda offers fine urban response and cruises along at highway speeds happily enough, but its CVT ‘drone’ and lack of low-down engine torque means it struggles just like the others under heavy throttle. It’s on par with the ASX and C-HR, just a little noisier. Of course, all of these car are happy enough just pottering around, but the Mazda is the most agile and responsive, while the Toyota is the most refined. The other key testing metric is fuel economy. The ADR combined-cycle claims of each are: 6.1L/100km for the Mazda, 6.4 for the Toyota, 6.9 for the Honda and 7.6 for the Mitsubishi. Commendably, all four cars proved to be very economical indeed. We put around 540km on each of the four, a mixture of city driving, highway time, dynamic loops and gravel, both loaded with passengers and one-up. The results were as follows: Toyota C-HR (7.1L/100km), Mazda CX-3 (7.3), Honda HR-V (7.4) and ASX (8.3), though the caveat is that the Toyota is the only car here that requires more expensive premium fuel. All told then, it’s clear that the Mazda takes the cake for performance, while the Toyota is the most refined. The fact this pair is also the most efficient means they are the winners in this category. The key to sorting ride and handling effectively in a front-drive city crossover is surely to balance ride comfort with highway stability. Sharp and nimble handling is an enjoyable extra, but certainly not essential. The Toyota is the newest car here, and the best-sorted. It sits upon the company’s much-hyped new architecture that’s already being used under the Prius, and is little short of a revelation for a brand too comfortable churning out forgettable whitegoods. In town, the C-HR irons out sharp edges such as potholes and speed bumps better than anything else here despite rolling on large 18-inch alloys and low-profile tyres. It also settles quickly after bigger hits, and has light and easily manoeuvrable steering and a great turning circle. On a long drive down the Hume Highway it was the only car here not getting buffeted and thrown about by crosswinds at all, and was consistently the car that best shielded occupants from tyre noise. Only some wind noise through the A-pillars disturbed the peace. The lane assist system also has steering assist that nudges you back between the lines, and while it’s not as brilliantly semi-autonomous as a Mercedes-Benz or Tesla, it beats the typical systems at this price point that only provide an audiovisual alert that you’ve strayed. Meanwhile our dynamic twisting loop showed the Toyota to offer sharp turn-in, excellent body control mid-corner and an ever-composed ride. If ever a car was begging for more power, it’s this one. The Mazda is a very different proposition to the Toyota, dynamically speaking. It feels very nimble and light on its feet, with quick steering that offers ample resistance and excellent handling. It feels the most car-like and darty here. On the negative side, it’s poor in terms of noise, vibration and harshness suppression, and also has a firm ride that at times becomes overly harsh over sharp edges, with vibrations being sent into the cabin and rack rattle through the steering wheel. The Honda is the polar opposite to the Mazda, in that it offers very light steering alongside very soft suspension to soak up the urban grind. Where it falls down is body control, with too much roll through corners and instability in crosswinds compared to the planted, nimble, yet still cushy, Toyota. The wheels also fall into potholes and drag the body with it at times, meaning the damping needs a fettle. How does this manifest? It just means sharp edges scare it a little. The Mitsubishi is quite good around town, with decent bump suppression. There was one particularly gnarly road join that it handled better than both the Mazda and Honda. Another thing we really like about the ASX is its commanding driving position. It offers easily the best clearance here, and the highest seat – which is key. On the downside, our test car with only a few thousand kilometres on the clock had a few disquieting squeaks and rattles that show up the age of its design, while its steering is a little too ‘heavy’ and its ride a little fidgety and unsettled over big hits, especially from the back seat. Additionally, the lack of seat support hurts in corners, and the slab-like sides pick up crosswinds in a big way. If we had to award a win solely on a small SUV’s ride and handling prowess, we’d have the Toyota, then daylight. Beyond this, the next best in a given area depends on your priorities. If you want sportiness go the Mazda, softness and ease-of-use go the Honda, and a commanding driving position look to Mitsubishi. The pedigree of all brands on test suggests reliability will be a given for each car, and each brand on test has substantial dealer networks (particularly Toyota). The Honda and Toyota each come with three-year/100,000km manufacturer warranties with roadside assist, the Mazda’s cover lasts three years with no km limit, while the Mitsubishi comes with a five-year/100,000km warranty. All four have annual servicing intervals, though the Mitsubishi and Toyota have 15,000km intervals (compared to 10,000km for the Mazda and Honda). The C-HR is the only Toyota passenger car with these intervals for now. The cheapest car to service for the first three years is the Toyota, at just $585 plus incidentals. Next is the Mitsi at $690. Both the Mazda and Honda cost $880 at current advertised levels for the first three visits plus incidentals, but remember those inferior intervals as well. In other words, none of these cars are expensive to own and run, though the ASX claims its sole victory, just ahead of the Toyota, because we value an extra two years of warranty over moderately cheaper servicing. That last line is a fitting way to feed into the conclusion, because while the ageing ASX finishes last here, there are areas where it beats the newer kids on the block. It’s very affordable, has proven mechanical solidity, is cheap to own and run, and offers the best ground clearance and highest driving position in class. It’s also spacious, second only in this category to the Honda. Splitting the Mazda and the Honda is very difficult, largely because they are clearly very different offerings despite obvious conceptual similarities. The Mazda is stylish and upmarket in feel, nimble and comparatively fun to drive hard, very fuel efficient, offers a leading infotainment user interface, and has some real brand cache. The Honda is less fun to drive, but is a little softer and quieter, and it also offers far and away the best rear seat space and the most practical cargo area. If roominess is key, then your car is the HR-V.
We’re going to call it a draw between these two enemies, and don’t forget that MY17 updates for both are just around the corner. There’s no doubt that it’s the Toyota C-HR that takes the win, as you’d expect of the newest car on test. It’s not perfect: the blind spots are irritating, the engine adequate at best, and the infotainment already dated. But it’s the coolest car in segment by a mile, as a constant stream of engaged passersby attested to, brimming with modern safety tech, surprisingly spacious, and easily the best to drive. The C-HR is quite simply the most interesting Toyota on sale bar the 86 coupe, and commendably moves the small crossover segment forward enough to be our new first recommendation, whether that’s in base form or Koba spec.